Many people rely on padlocks to secure everything from the garden shed to their performance bicycle or shop shutters. But have you ever stopped to think about how secure your padlock really is? 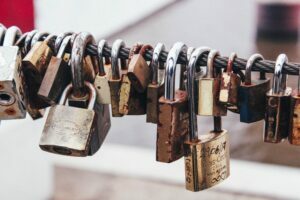 If you are in the dark over padlock security ratings, and would like to find out more about the different types of padlock design to help you decide which is best for your needs, read on. The shackle is the U-shaped part of the padlock which when secured in place can only be opened using a key, or a combination. It is the shackle that tends to be the main consideration when choosing a padlock. Long shackle padlocks offer greater flexibility as they can pass through multiple hasps or fittings, although they can be easier to breach. The longer the shackle, the more vulnerable the padlock will be. Open shackle padlocks are the most commonly used type of padlock and are suitable for an extensive range of applications from low to high security. With the majority of the shackle exposed, it is easier to pass through links and holes and around bars. Again though, the longer the shackle, the easier it will prove to breach. Closed shackle padlocks on the other hand prove less of a challenge to breach because there is less of the shackle exposed; however they are fairly limited in their uses due to the smaller space available for hooking over the item to be secured. Straight shackle padlocks are highly robust and the common choice for the likes of chains, containers, barriers, gates and shutters. They can be supplied keyed alike, which means you can have multiple locks in one place, all using the same key for convenience. BS EN 12320 classifies padlocks and their fittings with a coding system made up of seven digits. The sixth digit refers to the corrosion resistance of the padlock. If you are using your padlock indoors, number one is sufficient. For outdoor use, look for number three. The seventh digit refers to the security level of the padlock and its fittings. Grades run from the lowest at one through to six for high level security. Grades three and four are suitable for most domestic applications, but it is always advisable to seek guidance from a Master Locksmiths Association accredited specialist to ensure the padlock you choose is sufficient for your needs. The security level is usually referred to as ‘CEN’ or ‘CEN Grade’ and as such you will see padlocks advertised as ‘CEN Grade 4’ for example. Insurance providers often demand that approved padlocks are used. Many of them ask for closed shackle padlocks as these are considered the most secure. Requirements will vary however, so it is important to check with your individual provider. Sold Secure padlocks are tested and rated to bronze, silver or gold standard, with bronze being the lowest. Our blog on Sold Secure explains this rating system in more detail. Always consider where your padlock is being used. Padlocks used outdoors will need to be corrosion resistant. A rusted padlock won’t offer the same level of security as a brand new one and will be much easier to breach. Price is another major consideration. As with anything, you get what you pay for. A padlock that costs just a few pounds is never going to offer the security you need to protect anything of significant value. Higher security grade padlocks will generally cost between £25 and £60. Finally, always remember that security extends beyond the padlock itself. Even the highest grade, most sophisticated padlocks won’t safeguard anything if they are fixed to rotten timber or worn fittings, or if the hasps are not fitted properly. Never fail to ensure your doors and frames are robust, and your hasps are fitted securely. Barry Bros Security is a Master Locksmith Association accredited security specialist with more than six decades of experience. We offer a wide range of padlocks in our London showroom, alongside the professional, tailored advice you need to ensure you are buying the right padlock for your requirements and circumstances.